When Catie Bouchard paid a visit to the East County Transitional Living Center in El Cajon, California (a city near San Diego) in 2015, which is a center for families transitioning out of homelessness, the interior designer didn't know that her life was about to change. But when she learned that folks were having to move into unfurnished homes, she knew she could help. "We encouraged the community director to have a family reach out if they needed furniture," she told Hunker. It wasn't long before someone did. "It was the Salas family, moving into a one-bedroom apartment with five kids," she recalls. "The mother was overwhelmed by the thought of all her kids sleeping on the floor. I don't know what came over me, but I told her that we would fully furnish and decorate her home." That was the start of Pen + Napkin, the nonprofit Catie founded to provide home furnishings and decor to families like the Salases. And there are plenty of them: California has the highest number of homeless individuals in the nation — about 134,000 in 2017, according to the U.S. Department of Housing and Urban Development. 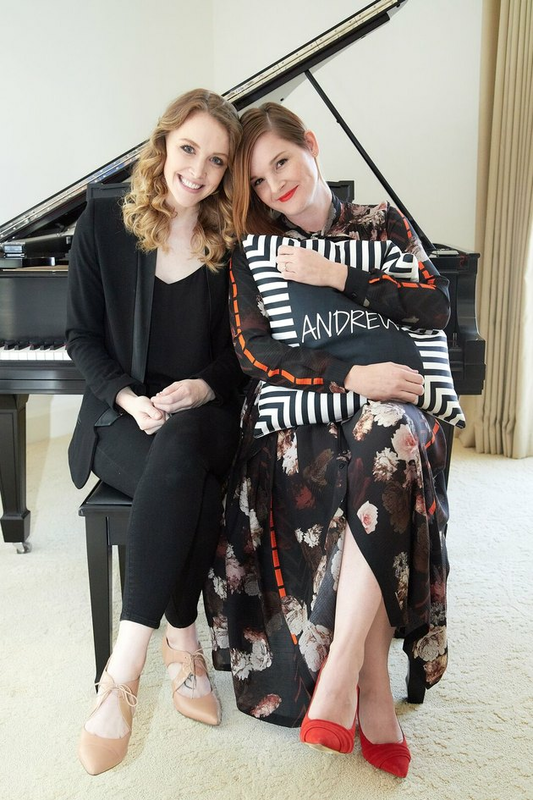 Today, Pen + Napkin has helped more than 60 families transition into fully decorated homes — and has captured the attention of some of the design world's biggest names, including Emily Henderson and Joy Cho, who are both donors. Catie is one to grab a napkin and jot down an idea or concept when it comes to her, so once she realized the need for furniture for families transitioning out of homelessness, her pen hit the napkin — and the nonprofit's name was established. 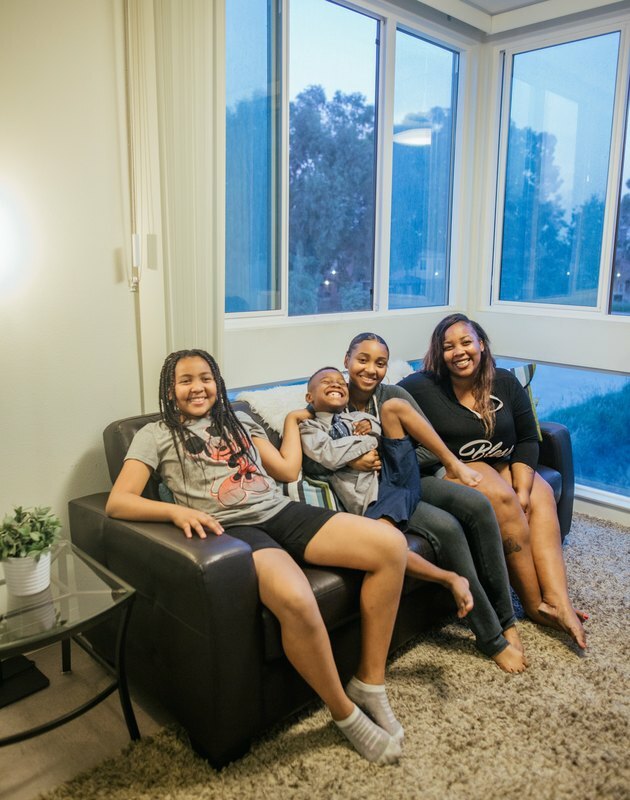 Pen + Napkin offers furniture and design services to families transitioning out of homelessness in Los Angeles County, Orange County, San Diego County, Riverside County, and Bakersfield. But if you want to help out and don't live in California, don't fret. Pen + Napkin is more than happy to accept simple funding donations, or you can reach out for help planning a project in your own city. There are also similar nonprofits across the nation that you can link up with, such as Humble Design. Humble Design serves Detroit, Chicago, San Diego, and Seattle, for example. The organization says that up to 50 percent of the formerly homeless return to shelters when they enter housing without furniture. But when supplied with furniture, only one percent return to homelessness after 12 months — quite an improvement. So how exactly does the process of furnishing a home with Pen + Napkin work, and how can you help out? Well, first the team at Pen + Napkin finds a family in need through their local transitional center partners: Union Rescue Mission, YWCA, and Penny Lane. Next, that family is assigned a designer — and that's where you come in. Pen + Napkin is always looking for volunteer interior designers who can meet with the families in transition to plan out their homes. But, if you don't have a professional background in design, there are still plenty of other ways to contribute. You can help with donation pickups, refurbishing furniture, raising money, and on move-in day. Simply providing your time is enough. Over the years, Catie has added staff, such as secretary, director of development, and friend, Ellyn Molzer, who quit her job in TV to help build Pen + Napkin. "A few months into our friendship, I helped on my first project; she was a single mother of three children and a veteran of our country," Ellyn told Hunker. "After installing all day, we were waiting for her to walk in and see her new home. I turned to Catie and said 'I want to do this for the rest of my life.'" Ellyn (left) and Catie (right) at a December 2018 fundraising event for Pen + Napkin, sponsored by Lamps Plus. Each child in a transitioning family receives a custom photo pillow from Lamps like the one Catie is holding, with his or her name on it. Through volunteering, you help to create a fresh start for a deserving family in your community, like Laquana's. 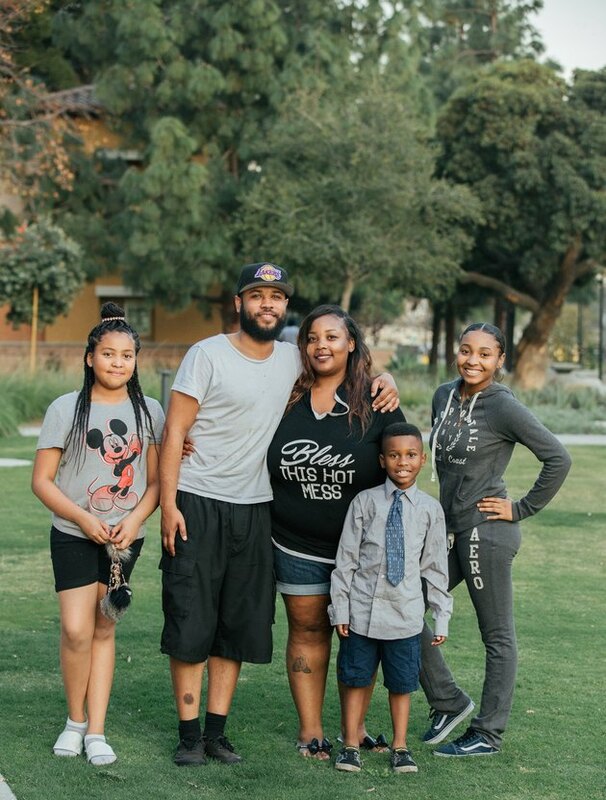 Laquana, a foster mother and former foster youth herself, reached out to Pen + Napkin for help furnishing her new home. Laquana and her kids in their home furnished by Pen + Napkin. "A lot of the time when we do installs, neighbors will come out of the woodwork to help us because we're making such a ruckus in the building," Catie said. And neighbor Hakim did just that. He helped with the move-in, even buying the family a new bunk bed when the donated one arrived with a missing part. Now, he and Laquana have been dating for about a year. Pen + Napkin: furnishing homes and creating love connections since 2014. Hakim, Laquana, and her kids. So what's next for Pen + Napkin? A home goods line in collaboration with furniture company Poly & Bark, part of whose proceeds will benefit the nonprofit. The launch date for the line is still under wraps, but it will be sold on the Poly & Bark website. And what are Catie's hopes for the future of her nonprofit? "I want to see designers from all over the U.S. take on Pen + Napkin projects in their own cities," she said. 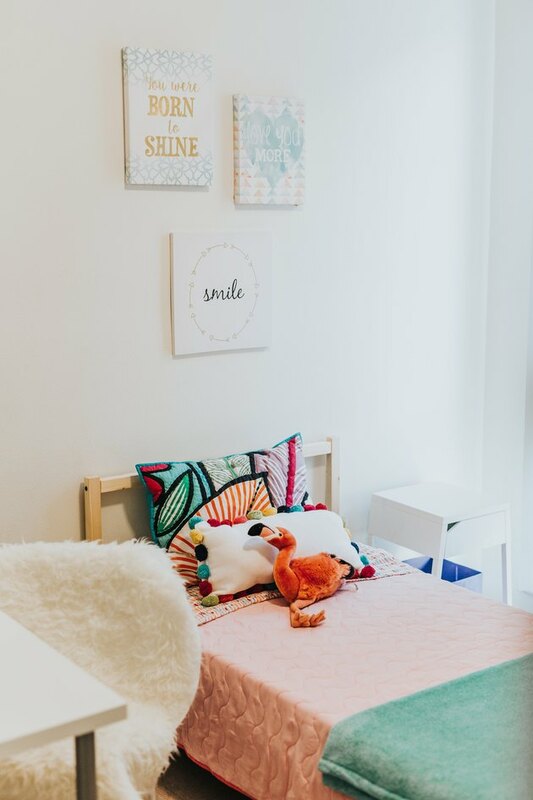 "I want to continue to find transitional centers to partner with and connect them with designers in their area, train the designers, and see more families move into fully furnished homes."